Great layout here by John K and a very welcome addition. The Tri-Vibe was born from the idea of developing a true vibrato pedal that could be built without resorting to parts matching and complex adjustment procedures. Various frequency modulation alternatives were analyzed to accomplish this goal. There are numerous pseudo-vibrato implementations built around modified chorus and phaser pedals where the dry path is canceled, leaving only the wet signal. Several shortcomings to these approaches exist, such as: non-sinusoidal modulation (a sinusoidal LFO is a must for authentic vibrato), uneven frequency modulation across the audio band, poor noise performance, limited bandwidth, and intrinsic time delay. Delay chips such as MN3007 or PT2399 were dismissed mainly due their limited bandwidth and the intrinsic delay associated with them. The Wurlitzer vibrato was also considered, however its implementation required a rather large number of components. This left the all-pass stage alternatives. We initially thought that at least four all-pass stages might be necessary to achieve the goal of true vibrato, but after further investigation we found that as few as two all-pass stages could be optimized for linear phase variation within the guitar frequency range. This explains the unusual 15:1 capacitor ratio that sets the frequency of each stage, as this arrangement can produce a quite flat +/- 90 degree phase shift variation for frequencies between 80 Hz and 6 kHz. In order to implement the phase shift stages, the most common options were considered for the variable element: junction field-effect transistors (JFETs), light-dependent resistors (LDRs) and operational transconductance amplifiers (OTAs). JFETs and LDRs were discarded because they have wide production tolerances that would require precise matching and/or careful adjustments. On the other hand, OTAs are reasonably matched and predictable, so no parts selection or adjustments are necessary. Different OTAs exist, such as CA3080, CA3094 and LM13600/LM13700. We decided in favor of the LM13600 device since it includes the output buffers and contains a pair of linearizing diodes that allow an improvement in the dynamic range and S/N ratio. In addition, we added corresponding pre and de-emphasis networks at the input and output buffers to further improve the S/N ratio. The next challenge was to generate a suitable modulation signal. As a side note, in most phaser and chorus pedals adapted for vibrato mode, the lack of "proper" modulation vs. time produces an unappealing "motion sickness" characteristic. So, starting from a conventional triangle waveform generator with a predefined output level, a pseudo-sinusoidal signal is obtained by means of a 4k7 resistor, the 10k DEPTH pot, and two back-to-back diodes. The LFO is not finished yet, for the sinusoidal control signal needs to be exponentiated to obtain symmetric phase variation at each peak of the sinusoid. This final task is performed by the nonlinear arrangement of diodes and biasing resistor in the opamp stage U2b. Again, this section of the circuit requires no component matching or adjustments. This is a fantastic effect. Loving it! Gotta build this one. I'd found John's layout on the forum a while back so I'm leaving him a big "thank you" here for sharing. Is that a red LED next to D3? It doesn't use an LDR or something similar? On the plus side, I believe it does blink in time with the effect so you can run wires out to offboard it. found on my build that it needed the 3 diodes subbed in. Red LED wasn't creating enough vibe.. I've built this one, and after a few mistakes its working! Great sound! Thanks for the vero! This one is great, it easily goes in a 125B. Thank you for the layout. I built this but when I plugged it in the 22ohm resistor burned out. I can't figure it out. Should I have used a 1/2watt resistor instead of a 1/4 watt resistor? Personally I just don't like using very low value resistors for supply current limiting because they have the potential to be working at or beyond their limits. So even though I may post layouts with the low values sometimes to keep them true to the schematic, I usually don't go lower than 47R when building anything myself and usually stay above 100R. I may be worrying unnecessarily but I can't see the point in using something too low when you can do the same thing with a larger resistor and the effect will end up sounding absolutely identical. Having said that, 22R must be fine because a lot of people have built this circuit and so if you had a burnout it may suggest a short or other problem elsewhere which is the main concern. I'm an idiot. I hooked up the power supply backwards. Luckily the resistor burned out before the cap exploded. This looked very familiar to the Ruby Amp I built. The transistor was oriented wrong and the cap popped. Given that there was no transistor I was totally confused. Thank you for helping this novice. Does anyone have voltage readings for this? I corrected the power supply screwup but the effect is very subtle and it has a very lo-fi/tinny sound. I think the reversed polarity may have killed one of the ICs. I have got the same problem, "a very lo-fi/tinny sound",. Plus the led doesn't blink? Does anyone have any solution or advice? 2 series 4148+red led make a huge effect... so I used a 2 position dpdt switch with this and 2 series 4148 to choose between 2 different ranges. Half way the build I stumble on a problem. I have to know with side is +V en - V of the capacitor used on row 10 (Rate 3 row) en row 15, seeing from top to bottom. Row 10 = + or - V? Row 15 = + or - V?. Because a bought an radial capacitor (http://www.newtone-online.nl/catalog/product_info.php?products_id=367). The capacitor symbol on the layout has a small lighter blue "-" mark clearly shown on one side. Zoom into the layout if it isn't clear for you. I mean the green cap (1 UF) between row 10 and 15. (I can't see a blue "-" marker on the green caps). Aah right. I don't know. The way to check it to build it up omitting that cap, and then measure the voltage where each side of the cap connects to see which side is higher. But you've got to be careful, sometimes non polarised caps are used for a reason, for instance when rotating one of the pots can change which side has the greater potential, so I would personally want to get a non polar poly or multilayer ceramic even for that particular cap. If you want to use polar, measure as I mentioned, but then also rotate all the pots to each extreme to make sure the side with the higher voltage stays that way. The Mode pot in particular is around that part of the circuit. Thanks for the rapid answer. I won't take the chance of blowing the effect up. I will buy a non polar poly or multilayer ceramic. I was thinking of using this Cap (http://www.newtone-online.nl/catalog/product_info.php?products_id=1373). yes. no problem. generally anything over 25v is ok. and in some places you could use even 16v. I finished my Tri-Vibe today. It worked the first time. Great Vibe!! But I hear the tempo off the LED blinking over the Amp (very soft noise, but hearable). Is there a way to eliminate this?? Apart from the position of Mode 3, what are the differences from this layout? It's not a big deal but it's fair to mention it. Of course if I'm wrong I'll apologisìze. No you are not wrong. Once we realized that all of the contributions from this gentleman were nothing but carbon copies of other people's work, we did call him out on it. We are currently discussing what we should do with the remaining ones. Some of the blatant ripoffs have already been deleted. Taking other folks' work and branding it your own is something we simply don't tolerate. Thanks for pointing this out. You will never find a layout from Mark or Mirosol to be a copy of someone else's work. I know you and Mark wouldn't do it. I once made a DBA Robot layout and once he reversed the gain pot it became his. Nobody is making money by drowing vero layouts. It's just a fun thing to do. John is a very helpful and talented person and I'm sure he doesn't need to do that. He should just not write his name or at least add the original "owner" with his. Once i noticed one of his contribution was a copy of Sabro's work i called him out on it on the forum. And then other layouts started to be called out by other people. For this reason (and as well as tarnishing our good names too) johnk is "persona non grata" in this blog and on our forum. I only wish he would have had a decency to tell us which ones of his "work" were copied from somewhere else. That way he would have walked away with just hurting his image - not taking us down with him. We are not actively following which circuits are drawn on other forums and by who. That's why something like this can happen. But for the future, we don't take contributions to the main blog at all. Unless we know the author personally and are convinced about the origins of the said work. What completely pissed me off was a layout i did from a erroneous schematic. Instead of helping me fix the errors, this gentleman "drew his own" using my erroneus layout as a base. Fixed the errors (without letting me know what they were) and posted it elsewhere. As his own. Of course. I honestly did believe we were over this all and his work still up on the blog was original. Since this isn't a fact, we are currently discussin of removing all his "work" from both, the blog and the forum. It is one thing to do wrong things, but to involve others in the aftermath is not acceptable. There will be an announcement on the forum and this post is to be deleted soon. With a few others. It is really annoying, specially from someone capable of drawing really good layouts. Again, I really don't get it. Talented? No doubt about, just have to look his basses and pedal builds, really neat and clear. Helpful? If helpful means "Don't know, my build works", "My build works great and I get none of the problems you have", "This pedal is really noisy, but I was able to get rid of the noise" (with no other explanation), or "Why have to expalin something that is self explanatory" (when a dude asked him about how he get rid of the ticking noise of a rate led), and so on..... yes, John K-opy is really helpful. Maybe this man is a great luthier, and surely a great pedal builder, but honesty is always 4 steps behind him, and have never understood what "DIY" means. Sad thing. But i once again agree with Javi completely. I'm still quite pissed about dragging my name through the mud with these copies. I've "called out" one of the copies before...can't remember when...Glad to know you Mark and Miro are doing something about it. Cheers! What should I do to increase Depth? Just a few subs... Upped the 22r to 100r, 1u output cap changed to electrolytic (as per ROG schematic). I read that subbing the LED for 3 series 4148s may improve depth but I didn't hear a difference so I stuck with the LED simply as it looks better. I noticed that the vibrato setting gets deeper as the rate increases. Not a setting I would use anyway. The univibe setting is the business! Spent the last hour playing Jimi tunes...never a bad thing! The "whirl" setting has a leslie cab feel to it. Not great, but will do on a live stage. If anyone is looking for a Rate indicator LED, take a feed off pin 8 of your quad opamp > LED + and the LED - > current resistor of choice > GND. Is it just a ''regular'' 3mm red LED, 5mm or something else? Is it a 3mm LED or a 5mm LED? Or maybe it doesn't matter? Thank you in advance guys.. Shouldn't the 1u on pin 9 of the LM13600 be 220n? 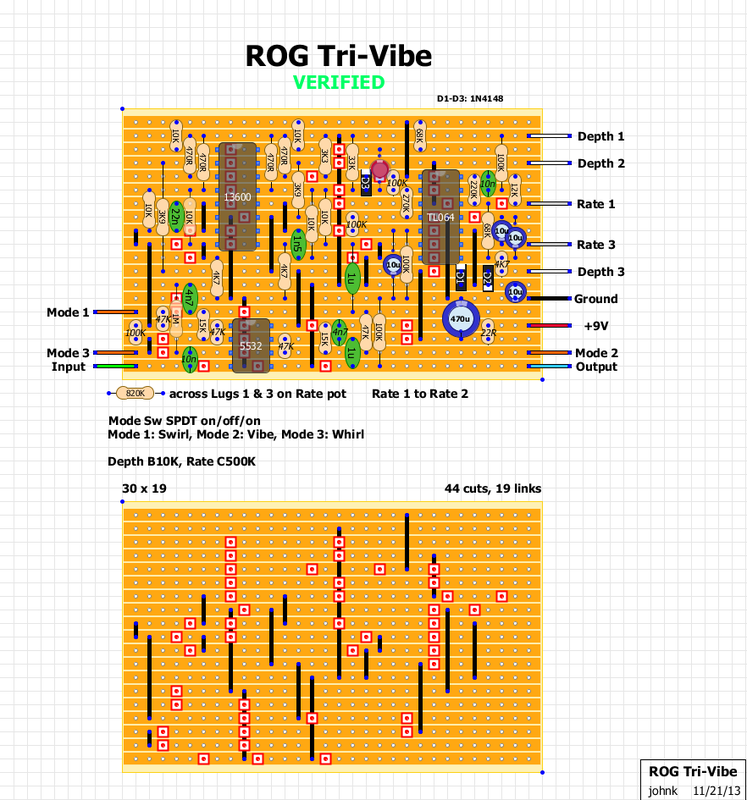 I've just noticed the same based on the schematic on the ROG website. Also the 1u it's suposed to be electrolytic. I don't know if those changes make a big difference. Hi man, did it work with those changes you made? I'm a beginer and I'm a little confused because I also noticed those difrerences and some more comparing this layout with the ROG Schematic. Ihave checked the schematic again and it seems that the 100K resistor to Depth 1 is correct. The only differences are the 1u cap at pin 9 of 13600 that should be 220nF and the 1u at the output that shoul be electrolytic. Well, that's at least the only ones that I found. I love this pedal. I want to be able to slow the rate down to very slow. What mod would I have to make. Finally got it working. Great sound, pleasent vibe. Is there a difference between the 13600n and an? Which one is better for this circuit if there is? Thnx everyone!! Hey I just made couple of these for some buddies. I found using a lm324 for the dual opamp was much better NO Ticking. If your getting tivking all the shielding wont help if its a poor quality tl064. I dont shield anything now and its great. Just built this and as mentioned above the schematic calls for a 220nf cap and not the 1uf, and the polarised 1uf cap on the output. I caouldn't really tell the difference after correcting my layout. Oh strassercaster that 10k you mentioned attached to depth1, well it is correct as all the components on that line are connected to vref. I swapped an LM13700 and LM13600 over and over and I thought maybe the LM13600 is slightly more pronounced but maybe I am biased towards that chip. If I was blindfolded I don't think I would be able to tell you what chip was in the circuit if you know what I mean. Brilliant circuit from runoffgroove, sounds great on all settings and I had no ticking at all. Hi guys, I am just building it. Well, in fact the circuit itself is now finished, but... it does not work, and I have no clue why. Previously, I've done few pedals that worked pretty fine so this is a surprise to me. First of all I wanted to make this blinking rate LED mod as mentioned on Runoffgroove's site. Done LED circuit on a breadboard and tapped the 8th lug of the TL064 and nothing. Checked the output voltage and there was 0,63V whereas it should fluctuate, right. If anyone of you had the same issue and resolved it, please give me a shout as I am now confused about it. OK, fixed it. Found the faulty jumper that did not carried over the Vref voltage. Now the LFO circuit works fine. But now the guitar signal is distorted after LM13600, which shouldn't be the case I guess. Anybody had the same issue? Posting this now with an account... Built this, and though the effect works I am getting two problems: One is the background hissing. I have gone over everything three times, tried different IC's to be sure it was not one of those and did the change to the polarized 1uf on the output with the .22uf. No change to this problem. Other issue is when the effect is engaged the volume is boosted significantly. No idea what is causing this. Checked for solder bridges and such (there were none). If anyone has any ideas, I would appreciate it. Double check your resistor sizes .